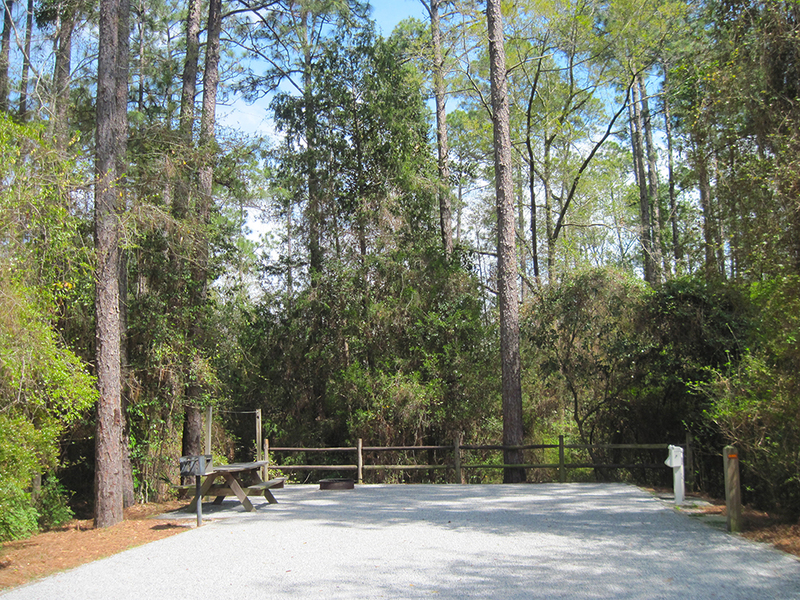 Camping at Blackwater River State Park | Florida Hikes! 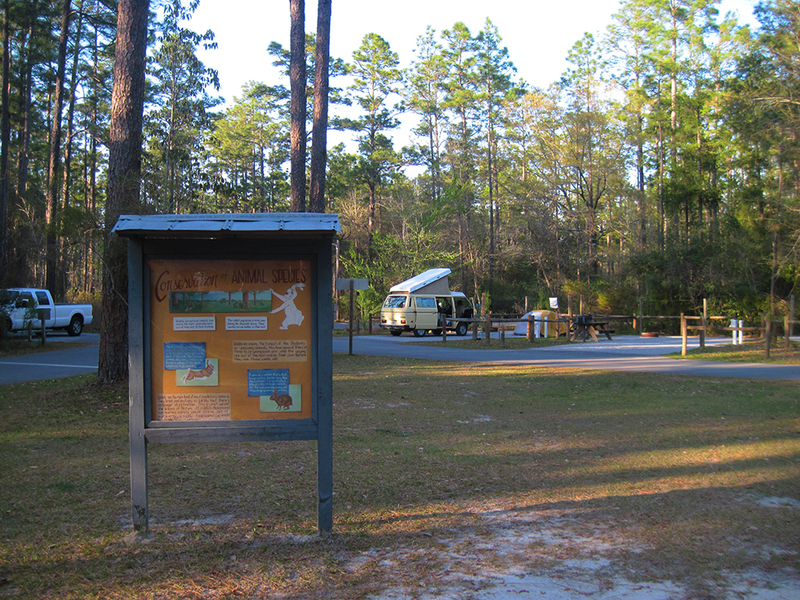 While at the Panhandle Trace Hike we camped at Blackwater River State Park. We didn’t know in advance that this particular state park campground is designed for RVs, trailers, and other folks who don’t camp in tents. 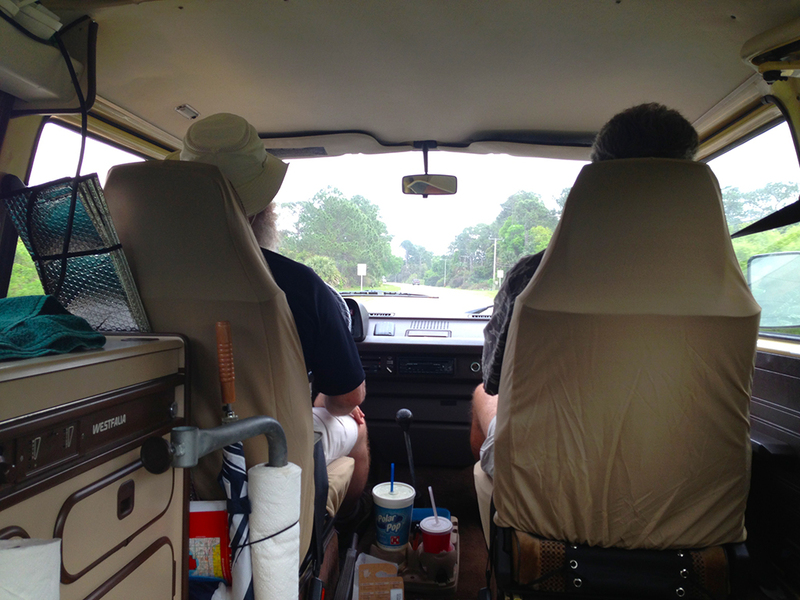 After months and months of camping in the woods, it was quite a shock to our way of doing things. 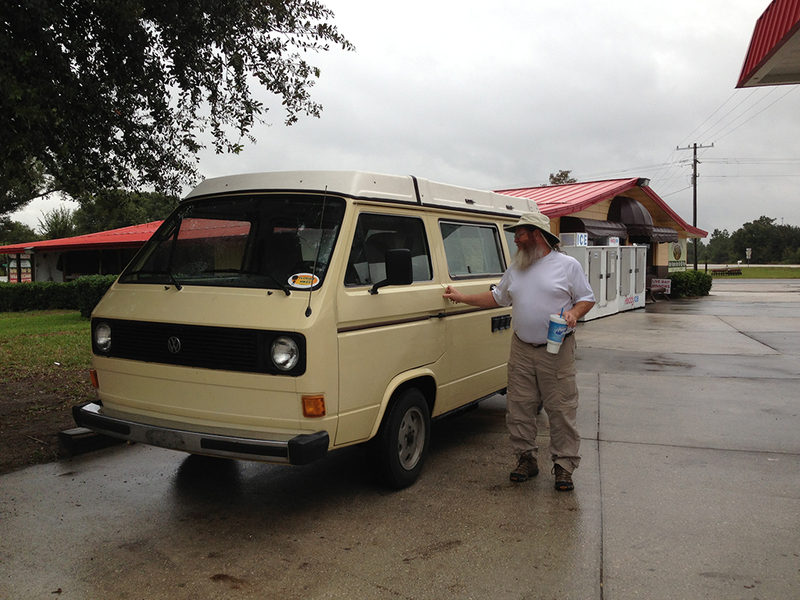 Being an old Boy Scout and leader I take for granted all of things I’ve learned through over forty years of camping, so running into fellow campers with little or no camping experience has given us the idea of more sharing reviews of the gear that we use regularly and, now, the campgrounds we’ll be visiting in our travels with Primrose. 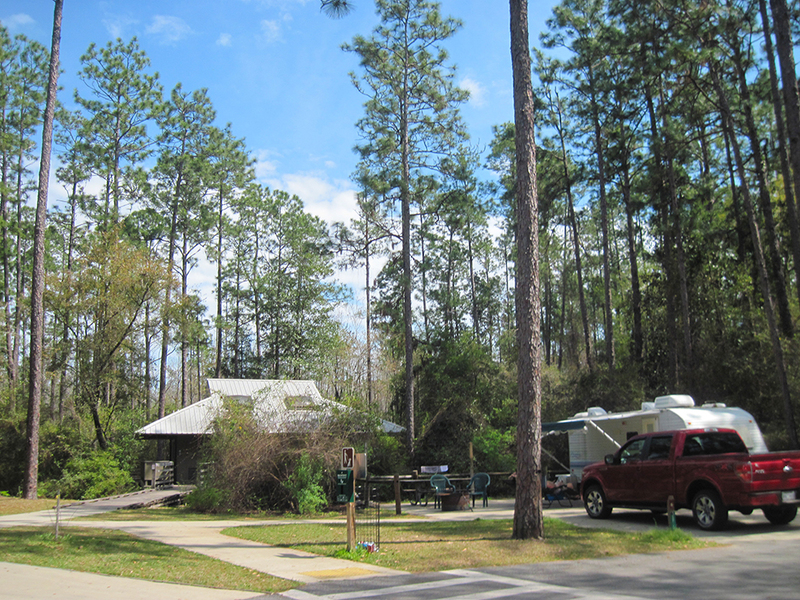 Our first big shock: at Blackwater River State Park, camping on the grass is prohibited! We know because our friend Linda set her tent up in the grass on the campsite instead of on the “official” gravel camping area. The ranger came by and told her to move it. Setting up a tent on gravel comes with many challenges, as we found out as we helped several of our tenting friends set up. After several bent tent stakes, we realized that there was a thick pad below the rocks that was nearly impenetrable. Luckily, everyone was using free-standing tents. Once their gear was inside, there should be enough weight on the tent floor to keep it from blowing across the campground in the wind. However, weighting down your rain fly is a bit trickier. Setting up a tent on gravel. Neither easy nor recommended, but required at this campground! That first night additional lengths of line were added so the stake could reach off the gravel pad. I suggested leaving that stake for last and placing it in the grass under the cover of darkness. Other lines were tied to picnic tables and coolers. Thinking more about it, I remembered an old trick for use in snow or soft sand. Ziploc bags were filled with gravel from the pad and then the line was tied around them. 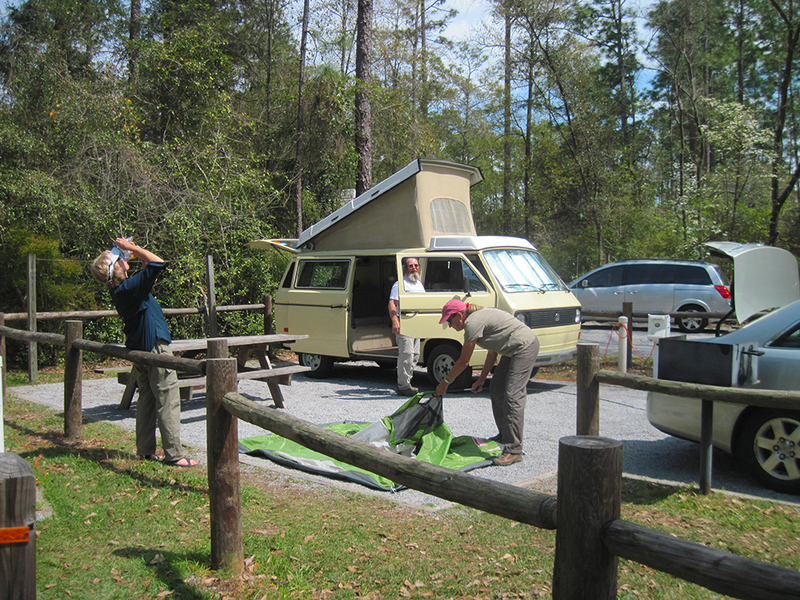 While camped at Blackwater River State Park, we heard of at least three air mattresses with leaks. Could it have been that sharp gravel under the tent floor? In our little group, an experienced car camper came to the rescue with an extra folding cot for a friend whose mattress deflated the first night. Along with the comfort of not being on the gravel, another wonderful feature of a cot is being nearly a foot off the ground. It makes life a little nicer when you don’t have to get off of the ground when hiking daily. I’ve used folding cots for years on large-scale bike rides, where your gear is toted by truck to the next campsite. Often the rules state NO cots. But mine, unlike a big heavy army type cot, folds compactly and fits inside the approved-sized duffle bag. 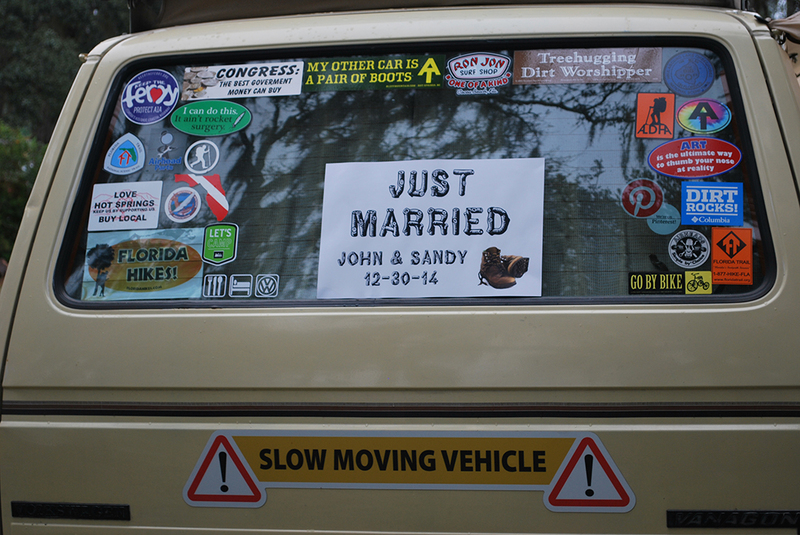 A car trunk can carry a lot more that you backpack. So why not add a folding cot to your car camping gear? In Primrose, of course, we had no problems. 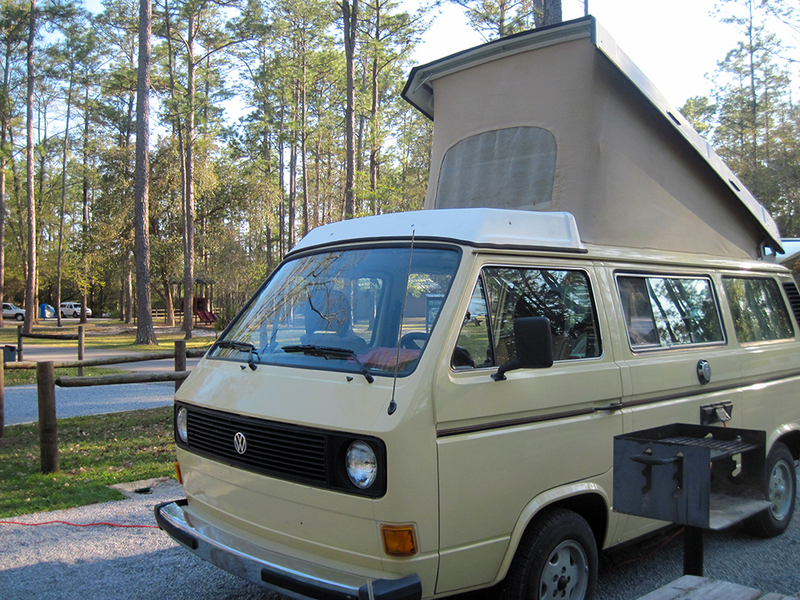 Due to our late attempt at booking online reservations, we had to change campsites four times in six days, but that’s not quite the hassle with a camper van as it is with a tent. The bathhouse was well-maintained and always clean, although the showers were not well-designed as a puddle kept appearing on the floor of the changing area instead of going down the drain. We’d planned to leave a comment card to mention that and the tent camping issues, but the cards disappeared after several days and were never restocked by the ranger who checked the campground several times a day. The sites vary greatly in size, enough so that you’ll want to look at their online (through the Reserve America reservations website) before booking one. Trees were cut down to create the sites so very few of the sites have any shade. If you plan to spend as many nights as we did (in one site), bringing your own pop-up canopy to set over the picnic table would be a smart idea. Some of our friends did that so they could have an outdoor kitchen and gathering place. 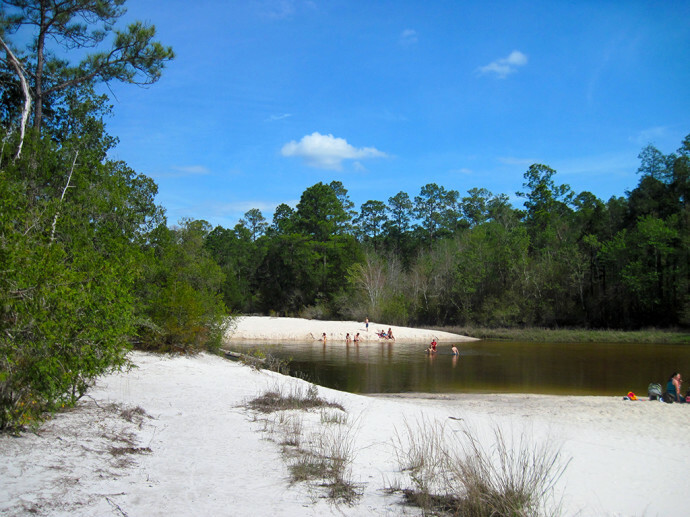 It was a short walk down to the Blackwater River on the nature trail, with access to a beach that most of the day users never see, unless they walk the entire nature trail system and not just the Juniper Lake Loop. The trail to the ranger station seemed like a much longer trek, but it was in the pine forest and a pretty walk. 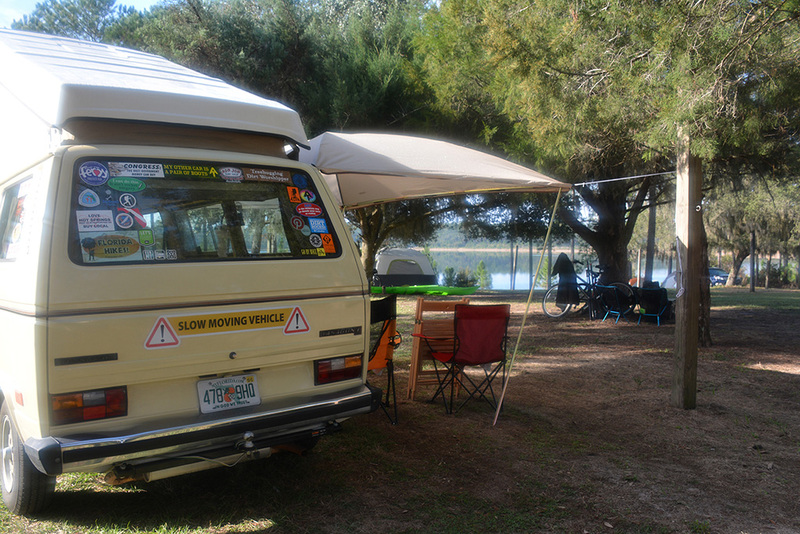 Although it is beautiful, we wouldn’t recommend Blackwater River State Park to tent campers, since it’s not at all friendly towards tent camping. They really do need a dedicated grassy area for tent campers to enjoy pitching a tent under the pines, with basic electric outlets and a shared water tap and no gravel under the tent. 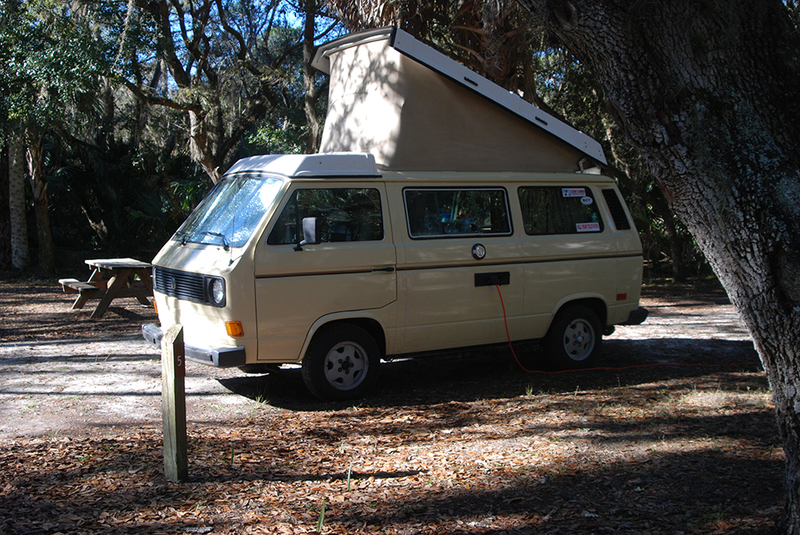 But if you have an RV, a camper, or a van, it’s a wonderful place to camp.